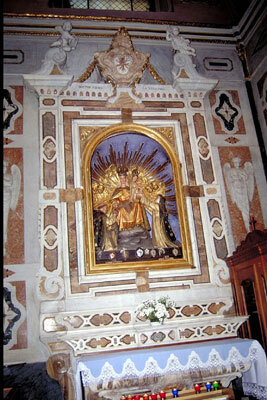 The characters of the statuary group are the Madonna and Child with Saint Catherine of Siena (which was a Dominican Tertiary ) , San Domenico da Guzman (founder of the Dominicans ) . The statues are of an almost life-size and placed in a niche , closed by a glass door. The statuary group is from Paris, but was inspired by the famous painting that is in the Shrine of Our Lady of the Rosary of Pompeii . NOTE : Rosary comes from Rose . 150 Hail Mary that compose it are like a bouquet of 150 roses offered to the Mother of God . Both Jews and the Church turn to God by reciting the 150 psalms of the Bible . ( It so turns to God with the same words inspired by Himself ) . The Rosary was born for those who wanted to imitate the recitation of psalms ( recited for centuries in the Church in Latin ) from those who could not read or did not know enough Latin. After the Supreme Pontiff John Paul II added to the traditional Joyful Mysteries , Sorrowful and Glorious - the Mysteries of Light , the Hail Mary became 200 .